2018-19 athletes of the year Gia Spiropoulos (left) and Ryan Rodger (right). Pictured above are the students who received most valuable player (MVP), team, and rookie of the year awards in each of Lakehead Orillia’s sports teams: varsity golf, equestrian, men’s and women’s hockey, dance, men’s and women’s varsity indoor soccer, and men’s and women’s basketball. 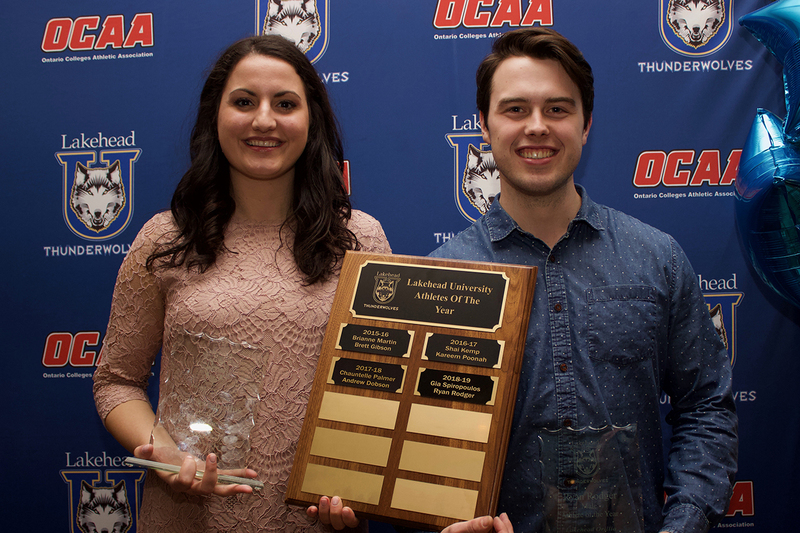 Lakehead University Orillia celebrated a successful 2018-19 athletics season on Friday, April 5 by handing out their awards at the annual Athletic Awards Banquet held at Hawk Ridge Golf and Country Club. Gia Spiropoulos (Women’s Basketball) walked away with the Female Athlete of the Year, with Ryan Rodger (Men’s Hockey) claiming Male Athlete of the Year. Awards were also presented to top student athletes in each of the University’s sports teams: varsity golf, equestrian, men’s and women’s hockey, dance, men’s and women’s varsity indoor soccer, and men’s and women’s basketball. Most valuable player and rookie of the year were announced and presented by the team coaches, who were also recognized and thanked by the University.